So wrote a reader of her “challenging” dog. Well, I’m glad the poor dog’s owner recognises he has good points! But the rest of her statement means that she doesn’t understand her dog or his motivation one bit. THIS FREE ECOURSE IS A BONUS FOR YOU WHEN YOU SIGN UP TO RECEIVE EDUCATIONAL EMAILS AND OCCASIONAL OFFERS FROM ME. YOU CAN UNSUBSCRIBE AT ANY TIME. Disobedient. The dictionary tells us this means “refusing to obey rules or someone in authority”. Now if you’re to obey rules, you have to know what those rules are. And I’m willing to bet this dog has NO idea what the rules are that he’s meant to “obey”! There seems to be an extraordinary misunderstanding rife amongst dog-owners. They think their dog arrives pre-programmed with English (or Spanish, or Turkish, or whatever they speak themselves). They think that the dog will have a perfect understanding of the meaning of words enunciated loudly and with clarity. So “SIT!” should immediately have the dog sitting. How is your non-verbal, non-human, dog meant to know this? In the first place, your dog needs to be taught what it is that’s wanted - not left to guess, take pot-luck and hope he gets it right. You have to give the dog information about what it is you want, not just what you don’t want. Think of a toddler in your home. You’d be showing her what you wanted, kindly and patiently, naming objects and actions in that motherly chatty way that comes naturally to loving parents. Requests would come as suggestions, (Do you think your teddy bear would like to have tea now?) You wouldn’t bark orders at her! You wouldn’t expect her to understand language before she is verbal herself! You may treat your dog the exact same way. And it’ll help if you think of how you get your wishes known and followed with your human family. Do you order, or “command” your partner or family? Or do you perhaps ask them? We give and take. We assess a person’s mood and act accordingly. We adapt our requirements to the situation. We are kind and patient (if we want to keep the peace!). In enlightened dog training, we call these communications - not “commands” but “cues”. They can be vocal cues (“Would you like to sit?”), or they could be environmental cues (I’m holding your lead - if you want me to put it on you for a walk you need to sit). And no, they don’t understand every word - neither does your toddler. But they can get the drift. So if you take the word “command” right out of your vocabulary you may find that straight away you get on better with your dog. Really! •	Is it because she’s in pain? •	Is it because the floor is slippery so she’s unable to prop herself up? •	Is it because she’s distracted by the dog over the road/the postman/children screaming/the shopping bags on the floor/[insert your dog’s fear or fancy here]? •	… or is it perhaps because you never taught her? I’ve heard almost all of those words applied to a dog’s behaviour by a frustrated and thwarted owner! Often it’s new dog-owners talking about their first puppy. They clearly are labouring under the misapprehension I outlined above, and are expecting miraculous perception from this baby of another species. 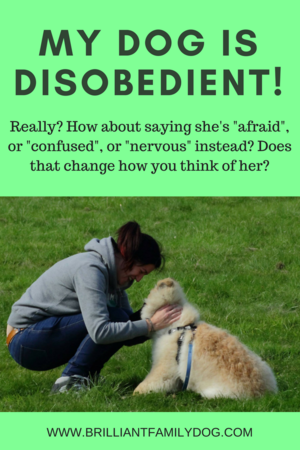 Usually I suggest they substitute the word they’ve used (often stubborn, difficult, disobedient) with a word which better fits the situation: try fearful, shy, overexcited, hungry, overtired … perhaps the sort of words you may use to describe that little toddler who is not doing what you’d like. Of one thing you may be sure - dogs don’t do things for no reason. You may not be able to see or understand the reason - but there is a reason! And as we’re meant to be the ones with the bigger brains, and we chose to have this dog live with us, it’s up to us to work out what that reason is. You’ll find some study of Dog Body Language will repay you well (see Resources below). Your dog will heave a huge sigh of relief when at last you seem to understand his clear messages! And no, they’re not obvious to most of us dumb humans till they’re explained to us. Once you know whether your dog is just distracted or - perhaps - afraid, you’ll be able to deal accordingly with the situation. Keep in mind that you cannot train an emotion-based behaviour out of a dog. They’re not operating on a rational basis at that moment, any more than your shrieking toddler who wants something she can’t get. So, as I replied to the reader I quoted at the top of this piece, assess the situation carefully before you apportion blame. Your dog needs your help and understanding, not condemnation. Want to know how I teach my own puppies? Here’s a taster course for you!